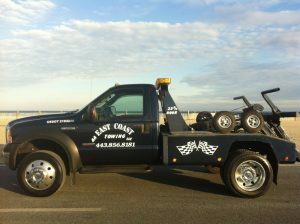 East Coast Towing is the company you can count on when you need emergency service anywhere in the Ocean City, MD area. We provide towing services to assisting people in their time of need 24 hours, 7 days a week. We cover many areas surrounding Ocean City including: Berlin and Bishopville. Why choose East Coast Towing when you need towing service? We offer reliable towing services at the best prices in town. Plus we have friendly and professional staff how will give you a quick respond to your calls. We always offers fast and prompt service. Our number one priority is customer satisfaction. In addition, we’ve been in Ocean City towing services business for over 10 years, and during that period of time we have gained a lot of experience how to assist our clients in emergency, and the result of our hard work is the positive feedback of our satisfied customers. When you need emergency towing assistance, give us a call right away at 443.856.8181, and we’ll be happy to assist you!